On September 6, 1941, shortly after the deportation of the entire Volga German population to Siberia and Central Asia, the Autonomous Volga German Republic was abolished. By the early part of 1942, the German place names in the Volga region were changed to Russian names. Although Norka did not have German name, (it is the Russian word for mink), the name of the colony was nevertheless changed to Nekrasovo. The Soviet secret police (NKVD) created a Special Settlements Department to handle to influx of German deportees to Siberia and Central Asia. At the time, the Gulag system was not equipped to immediately handle such a large influx of people. The so called Special Settlements were typically located within existing Russian villages and Germans were initially placed in the already inhabited homes of Russian and Kazakh kolkhoz workers, abandoned buildings needing repair, and even earth huts. In the Special Settlements they also experienced severe shortages of food, medicine, and winter clothing. As a result, large numbers of them perished from malnutrition, disease, and exposure. The reaction from their Kazakh and Russian "hosts" was mixed. Some felt sympathy for the deported Germans and others felt animosity towards the "fascists." The Germans were not allowed to leave the Special Settlement areas and had to report regularly to the Soviet authorities. 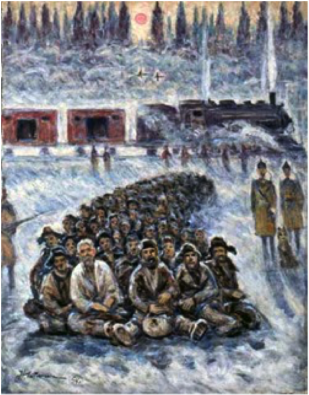 A painting titled "Moving Out" by the artist Nikolai Getman who was imprisoned in the Soviet forced labor camp system. Within months of the deportation, the Soviets issued an order on January 10, 1942 that subjected the German-Russians to conscription in the Trudarmee (Labor army). On February 14, 1942, the government required that all deported German males (ages 17 to 50) were to be separated from their families and sent from the Special Settlements to the NKVD's Trudarmee camps where they primarily were forced to work in construction or harvesting timber in the Ural Mountains. Some were assigned to work building railroads. On October 7, 1942, the Soviets ordered that the deported German women from age 16 to 45 also be sent to labor camps. This same order expanded the age range for conscripting men to include all those from 15 to 55 years of age. The only exceptions were men who were physically unable to work and women who were pregnant or those who had children up to three years of age. With so many of the adults sent to the labor camps, many of the Germans remaining in Kazakhstan and Siberia were children without any adult relatives to look after them. In the labor camps the people were formed into units of 1,500 to 2,000 people. The units were again divided into labor columns of 250 to 500 people and finally teams of 35 to 100 people who assigned to the same barracks. Each individual worked under a regime of forced labor, often with inadequate housing and food. Harsh climatic conditions and overwork led to a high mortality rate, but the dead were not recorded, so the exact number of victims are unknown. It is clear that within the deported German population, deaths exceeded births until 1948. Gulag in Perm. Source: Wikipedia. Stalin's regime conscripted hundreds of thousands of civilian German "Special Settlers" into the labor army. In 1942 alone, over 120,000 German "Special Settlers" were sent to work in lumber camps, industrial construction projects, fishing operations, mines, and railroad building. By 1943, the Soviet government had mobilized over 316,000 ethnic Germans into the labor army to perform forced labor. These labor battalions worked under NKVD discipline. The NKVD severely punished escape attempts and refusals to work, often through execution. The labor camps were not significantly different from the Gulags, they lived behind barbed wire patrolled by guard dogs, were watched from observation platforms, their presence was regularly verified, they were provided a minimal amount of food twice a day, and received one day of rest for every ten days of work. Those who refused to work were severely punished or executed. As a result of the inhumane conditions in the labor army over 60,000, or nearly one-fifth of those conscripted, perished during and soon after the war. 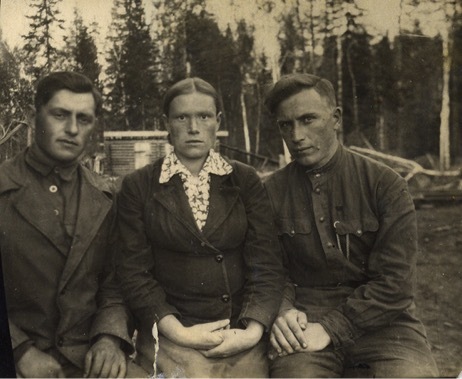 Soviet records show that at least 213 people from Norka and Neu-Norka were sent to TagiLag (near the city of Nizhny Tagil located in the Sverdlovsk Oblast) and 198 men are listed at Usollag (located in Solikamsk, Perm Krai - near the Ural mountains). In this early 1950's photograph, Alexander Konrad Schreiber, a native of Norka, is shown seated on the right. Alexander's wife, Claudia is seated in the center and a friend of Alexander's from Norka, Egor Schlidt, is seated to the left. At this time, life in the camps began to improve in comparison with the terrible years at the beginning of war. This photo, taken at a camp in the Ural Mountains, was provided by Alexander Schreiber, son of Alexander Konrad Schreiber. In early 1946, with the war over, the labor camps were abolished. However, the conscripted workers were to remain attached to the companies they were assigned to. They were allowed to move out of their camp, but had to remain living in the area. After years of separation, they were also allowed to write to their family members. On November 26, 1948 the Presidium of the Supreme Soviet of the USSR issued a "Top Secret" decree that placed criminal responsibility on those that attempted to leave the places of compulsory settlement. This decree directly and unambiguously stipulated that the Germans, like all other nations that were sent to special settlements during the war, had been relocated there "forever," without the right to return to their former places of residence prior to the deportation. The decree repeated the decision of People's Commissars of the USSR made on January 8, 1945 that those offenders attempting an unauthorized exit (escape) from places of compulsory settlement were subject to criminal liability. The decree of November 26th went further in stating that special settlers who violated the directive to remain in the special settlements were subject to the draconian punishment of 20 years of hard labor. Perhaps the most significant impact to the Volga Germans was the loss of their churches, schools, newspapers, and language. The traditions and culture of this ethnic group were significantly damaged by the deportation. The deportation of the Volga Germans was a form of genocide, murder not only of individuals, but of the ethnic group's sense of itself. This form of ethnic cleansing had been employed by ruthless dictators for millennia and was used by Stalin and his henchmen to repress numerous ethnic groups in the Soviet Union. With the death of Stalin in 1953, the deportation policy was reviewed and belatedly renounced. In March 1955, ethnic Germans were again allowed to have passports. On December 13, 1955, the Soviet regime released the German-Russians from the special settlements. However, the same decrees that eliminated the special settlement restrictions, also prohibited the German-Russians from returning to their homelands or receiving compensation for confiscated property. Soviet officials claimed that all of them had “taken root” in their new areas of residence. On Lifting the Restrictions on the Legal Status of Germans and Members of their Families, found in special settlements. 1. To lift from the count of special settlement and free from administrative surveillance of the organs of the MVD Germans and members of their families, exiled as special settlers in the period of the Great Fatherland War, and also Germans - citizens of the USSR, that after repatriation from Germany were moved to special settlements. 2. Establishes, that the lifting from Germans of the restrictions of special settlement will not lead to the return of property confiscated during exile, and that they do not have the right to return to the places from which they were exiled. In February 1956, Soviet leader Nikita Khrushchev condemned the deportations as a violation of Leninist principles. In August 1964, rehabilitation decrees were approved by the Presidium of the Supreme Soviet for the Russian-Germans, but they were again prohibited from returning to their homelands. Restrictions limiting where the ethnic Germans could live were lifted on November 3, 1972 and some chose to return to their homes at this time, although this was still officially discouraged. The former German colonies had been populated by other peoples for over 30 years and the new residents did not want the Germans to return. No longer in their ethnic conclaves, many Volga Germans intermarried with other ethnic groups living in the areas where they had been deported or served in labor camps. One last attempt was made in the 1980s to regain and revitalize their Volga German homeland. In August 1990, Soviet President Mikhail Gorbachev signed a decree "On the restoration of the rights of victims of political repression 1920-1950." Unfortunately, much of what was promised to repressed peoples, including the German-Russians, and was never implemented. It wasn't until October 18, 1991 (after the collapse of the Soviet Union) that the Russian government belatedly issued a decree rehabilitating all the victims of political repression. In 2015, ethnic Germans living in the Russian Federation continue working to perpetuate the memory of victims of political repression. Specifically, they are questing free access to archival material and memorial sites, the preservation and promotion of the cultural values of all peoples of the Russian Federation who were subjected to repression and the creation of educational and outreach programs related to political repression. Kazakhstan launched a social advertising program in May 2015 under the slogan "One country. One people. One destiny." The first series of the project is dedicated to the deportation of the Volga Germans. The video shows the Kazakhs as very hospitable people. In contrast, the real villains are the NKVD, who first performed the deportation order, and later - forcibly mobilizing adults into the labor army and weaning children from their parents. The video below is an attempt to keep the remaining Germans in Kazakhstan from leaving the country. Learn more about people from Norka who were interred in Soviet Gulags. 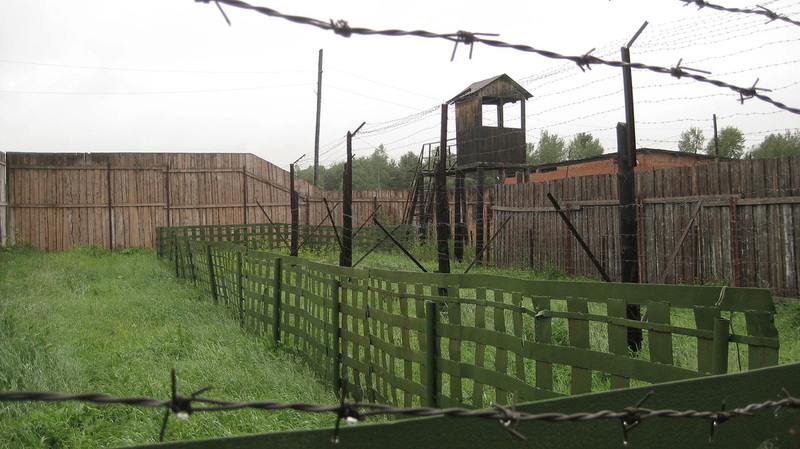 ​Search the Russian Gulag database here. "Book of Memory of Soviet Germans - Prisoners of Tagillag! (Russian Language). Книга памяти советских немцев - узников Тагиллага!" Книга памяти советских немцев - узников Тагиллаг! Гордое терпенье. Web. Apr. 2015. <http://www.tagillag.rusdeutsch.ru/>. Chebikina, T. "Deportation of the German Population from the European Part of the USSR to Western Siberia (1941-1945). (Russian Language)." Мемориал - Главная страница. Web. 16 Mar. 2016. <http://old.memo.ru/history/nem/Chapter14.htm>. Conquest, Robert. The Nation Killers: The Soviet Deportation of Nationalities. London: Macmillan, 1970. Print. Grib, E. A. Gedenkbuch : kniga pami︠a︡ti nemt︠s︡ev-trudarmeĭt︠s︡ev Usolʹlaga NKVD-MVD SSSR, 1942-1947 (A Memorial Book of the Germans in Labor Army Usollag NKVD/MVD the USSR 1942-1947). Ed. V. F. Dizendorf: Public Academy of Sciences of the Russian Germans, 2006. Print. Pohl, J. Otto. "The Deportation and Destruction of the German Minority in the USSR." JOP (2004): Print. Pohl, J. Otto. "Ethnic Erasure: The Role of Border Changes in Soviet Ethnic Cleansing and Return Migration." Sinner, Samuel D. The Open Wound: The Genocide of German Ethnic Minorities in Russia and the Soviet Union, 1915-1949 and beyond. Fargo, ND: Germans from Russia Heritage Collection, North Dakota State University Libraries, 2000. Print.